For seven days in March, museums across Canada and around the world lit up Twitter for a real-time international celebration of art and culture. 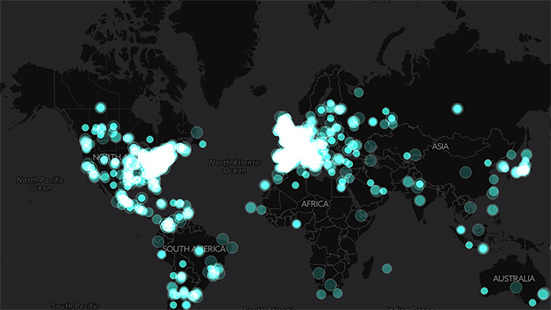 Globally, there were more than 600,000 Tweets using #MuseumWeek or one of the 7 daily hashtags. Those tweets were viewed over 237 million times on Twitter and across the web. This map summarizes the global reach of #MuseumWeek. For the first day of #MuseumWeek the hashtag was #secretsMW--an insider view of what goes on behind the scenes at museums. An hour later, the Curator of Visitor Experience, Jeff Gray, and Victoria decided to play on the #secretsMW theme and take #foundbunny on a behind the scenes tour of the Museum of Natural History. Victoria toured the museum with #foundbunny. Before the tour ended we were trending across Canada. Within hours, #foundbunny had gone viral. Our #foundbunny tweets that day reached over 178,000 people. The rest of #MuseumWeek saw it reaching over 400,000. The story was featured on the Huffington Post, Buzzfeed, Good Morning America, ABC News, and the Daily Mail websites. #foundbunny was also on the front page of the Toronto Star. We were overwhelmed by the response and the many requests to give #foundbuuny a name and a home. Our hope is for #foundbunny to be returned to his family. Until then, #foundbunny will remain safe and sound at the museum--we will let you know when he goes home.